I live in a zone where the temperature is high 68-70, and low 48-50, every day. 365 days/year. 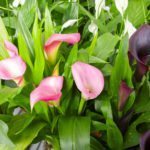 What will the blooming pattern be for the white Calla Lily? Perhaps it will bloom, then take a few. O this, then bloom again?? Hoping to know as the property we just bought has dozens of them. Thanks!